In shock and awe, as the Drama Desk announced their award NOMINATIONS for the Best of the Best of the Theater season 2014-15. I have so much respect for what these dedicated people do. The Nominating Committee sees something like over 270 plays a year!!! It staggers me the level of commitment to theater that these people maintain. And headed for the eighth year(I think) by the valiant, unstoppable Barbara Siegel (yes, she’s married to the famous Scott) once again this year, the nominations excite and confound me. I’m glad for instance that Ben Miles and Lydia Leonard were both nominated for Best Actor In a Play and Best Supporting Actress In a Play for “Wolf Hall” for playing respectively Thomas Cromwell and Anne Boleyn. But where oh where was “The Heidi Chronicles”?!? And any recognition for Elizabeth Moss’ and Bryce Pinkham’s terrific performances? I liked this revival better than I liked the original production, which I thought was horribly anti-gay. (But it made David Hyde-Pierce’s career in the same role as Pinkham.) But Pinkham and Moss did both get nominated for the Outer Critic’s Circle. I hope they repeat at the Tonys. They probably will as will Ben Miles and Lydia Leonard. You see, the Drama Desk has the daunting task of nominating EVERYTHING that can be seen in any given year on any stage in New York City. Broadway, Off-Broadway and Off-Off Broadway. Which is why I have so much respect for them. In other words, quality theater can be rewarded no matter how small or how big the stage it occurs on is or how many people see it. Of course, Superstars like Dame Helen Mirren in “The Audience” and Bradley Cooper in the now closed “Elephant Man” were nominated for Best Actress and Best Actor in a play. Mirren will totally win this award, as she will win many, many others this season, and for Best Actor I think it’s between Cooper and Miles. But more on that later. 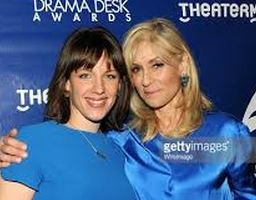 Past Drama Desk(and Tony) winners Judith Light and Jessie Mueller announced the nominees at ceremony today in the swank boite 54 Below.